How to Preview, Print, Download, or Send? How To Use Print Options? Note: Only Connect or Scale-Up users can download their previous techpack versions. Upgrade your plan to use this feature! Learn more. From your techpack dashboard, click inside the style techpack you want to view all the versions of. 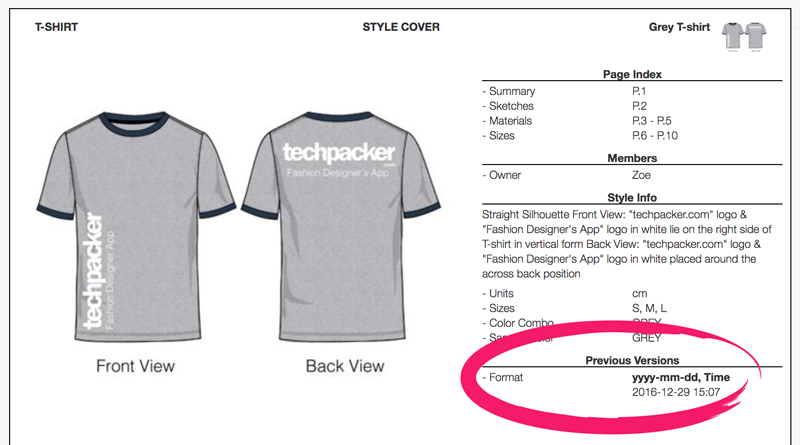 Once you enter the techpack style board, click "Preview PDF" clipboard icon at the top bar menu (see image below). OR click the "PREVIEW - PDF" on extended panel side sub-menu to access your techpack PDF (see image below). At the top of your techpack PDF preview, all the previous shared history of this particular style will be displayed. All versions will be categorized by the time and the emails it was shared with. Plus you can also view previous versions by clicking PDF link for reference (see image below). This is an amazing time-saving tool. All your techpacks and their versions are now well organized and you can access them anytime, anywhere! Additional Tip: To visually highlight the changes you are making in every new version of your tech pack, you should use Track Techpack changes feature.